New June chat thread is up! I remember when starting Keto that I did dream more. My feeling is that I have been dreaming more ever since too. I love it. I like dreams. Not me..i wish. i rarely dream. anyhow i sure dont remember them if i do..
Have any of you experienced more vivid and memorable dreams whi lie in Ketosis? It seems I do... Not every night, but it is a definite shift from rarely recalling dreams for months before going Keto! totally agree with that, James and KD!! if i mess up..i dont look back. when i think where i was before keto, i'm amazed at how far i've come and the benefits i never knew could happen. I remember a day when i literally thought i could never get under 250..and if i could just get to there i'd never complain again. I had tried so many things. and nothing worked. it was crazy!! When I was actively writing software, we were for a while focusing to an extreme degree on quality. Aiming for near perfection. When we had a tool that showed which lines of code had been run (and how many times) I decided to look at lines of code that had never been run by our tests and we would write new tests to get that part of the code executed. Quality went up. Our team even won an internal award for best quality. But, we spent a so much time on testing, that we didn't get all the features in the product that customers wanted, and we were late in meeting deadlines. In the end we realized that seeking perfection was the surest way to fail. I feel that way about Keto too. I'm so much healthier than I was before. I don't beat myself up when perfection isn't reached. I don't throw in the towel when I don't meet a goal either. I just keep going. Well I'm willing to take the 2 hours once in awhile to enjoy my glass of wine. Keto is a journey, not my whole life. Like Holly has said... I've done what I wanted for 50+ years.... now is my time to treat my body like it should be treated. Listened to a podcast today - where the doctor said keto/low carb is a spectrum. Some people may not need to go so strict - the whole world would benefit from eating more low carb even if they don't aspire to >20 grams per day. Our personal journey is personal - each person has a different path. LOL KD!!! I donâ€™t think I can either!! If I was in college now Iâ€™d be labeled a â€œlightweightâ€�. Hahaha!!! I like hearing anout the cold potatos..fascinating to me!! Good Morning. I am enjoying all these calculations and reasoning about our foods and wine. Sorry to bring up the dreaded cold potato again but , the one thing I remember doctor (weight loss DR) telling me about eating a very small amount of cold potato was that it is resistant starch which he said was not digested as quickly as hot potato and so it left you feeling fuller longer there by helping you to stop over eating. Not sure if this is true. Doctors have learned so much more over the years, so they may have a different view about this question. I drink wine also but not very often. Years ago I would have a 6 oz glass of red with dinner every other night. It started to not agree with me as I got older and so I gave it up except on rare occasions. Like this past Monday I had a glass. But for me I can just skip it and not even miss it. I agree with Karen that I don't think it is the end to KETO if you have a little now and then within your daily carb count. My biggest problem now is resisting all the fresh corn on the cob my DH has been steadily bring home and eating with dinner every night. It's tough, I love corn with butter. I make sure I have something like creamed spinach or chicory salad to help me resist. I have actually started to fill up on chicken broth an hour before dinner to avoid this temptation. Oh well, something I just need to get over if I am going to live KETO. Red wine is loaded with antioxidants, particularly flavonoids like quercetin and resveratrol. Other health benefits of red wine include its ability to improve cholesterol, fight free radical damage, help manage diabetes, fight obesity and prevent cognitive decline. Of course, the benefits do not outweigh the negatives if you over indulge. Right now it's none and I miss it. Its certainly true that one's tolerance for alcohol is down when eating Keto. I'm not sure why that is. But as I've pointed out ones body burns alcohol before any of the other fuels since technically it is a poison best gotten rid of as fast as possible. It has to be a thing about the body chemistry of people in Ketosis. It is different in that you burn fats easier, and its got to be different in some ways about alcohol is processed. Karen (KDGIRL), you are brining out the worst in me. ... oh yes, I can have a short attentions span and get easily distracted. So while I sometimes do CICO calculations, I sometimes don't believe them ... it depends on the day. Today? A 5 ounce glass would have 3.8 grams of carbs, and 125 calories, most of those from the alcohol. That glass of wine would keep you fuelled for 2 hours. The occasional glass of wine could certainly be managed from a carb point of view on Keto, though the less sweet the better. One of my squares of dark chocolate has 2 grams, so this glass of wine from nutritiondata is like 2 squares of 85% cocoa chocolate. From a weight loss point of view the wine is nutritionally empty. Maybe one could find some micro-nutrients in wine or chocolate that are useful, but I think one is just trying to justify consuming either one, when the truth is that you just enjoy a little of them, and that is all there is too it. Teresa; I also count net carbs and use Carb Manager. 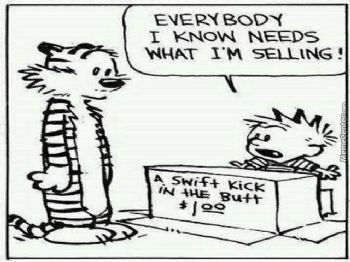 I mostly use it for the ease of it and percentages. I don't actually follow their calorie recommendation, which is 1239 for me right now. Karen, next time you try making faux tater salad, try using cauliflower instead of zukes. Quite tasty. Last night we made a keto tuna casserole and used cauliflower in place of pasta, my whole family loved it! Big hit, and I have Maria Emmerich to thank because I (kind of) followed her recipe in her keto comfort foods book. Also, I'm a wine lover, too. I used to have a glass at least every other night, some weeks a bit more, some a bit less. Since my recent gastrointestinal problems started I've not had any, but I do miss it, especially seeing my hubby having his glass! :) We've never been to a tasting or anything like that, but there are vineyards here in Arkansas that we want to visit someday! Holly, I've noticed I can't drink as much as I used to without feeling it. Being on this diet makes a big difference! Yes it's true - too much wine on a keto food plan is dangerous. However - if you eat your food, and drink A glass of wine, (or mixed drink or whatever your preference) you can fit it into your diet occasionally. Except Holly. I don't think she can. I love wine. I love to go wine tasting, have wine with friends, and enjoy a glass of wine with dinner every night. I have figured out I can't do that and lose weight though. So I am willing to give it up on a regular basis, enjoy it on a sporadic occasional basis, and still be keto. This is one of the draws to this way of eating - I can still enjoy wine once in awhile. I'm part of the San Antonio Stock and Rodeo Show Wine Committee - we host an enormous Wine Competition, a Wine Auction, and a Wine Garden at the Rodeo every year, benefitting scholarships for children. Our hashtag - #wedrinkforthekids. It's a fun group and a charity I enjoy. We still have to live life, right? Just maybe a little bit differently. Thanks for the science breakdown James. I know I'm interrupting my progress while I'm lifting my glass, but for 120 calories and 3 grams of carbs, it can't interrupt it for much more than an hour according to my calculations. If my BMR is 1455, and there are 24 hours in the day, 120 calories is burned in about 60.625 minutes. Are my calculations correct? So many interesting things to comment on. First potatoes ... yes, ... to go with my 6% guideline (6% or less of the weight of a food being carbs) then potatoes just don't make it, at around 20%. So one might try to somehow make potatoes low enough, by saying but when cold they have less carbs. Its true that some of the starch or carbs changes is less digestibility once it cools down. But really, not nearly enough to make it low carb or Keto. Second alcohol ... most food labels list carbohydrates, proteins and fats but not alcohol. So I've listed them in the order that the body burns them (more or less). Alcohol first. Why that? Alcohol is a poison, so its best to get rid of that fast. Carbohydrates second. Why second? Carbohydrates raise blood sugar, and that is not good, not as bad as being poisoned, but not good, so get rid of these. With those out of the way, burn fat. Nothing unhealthy about this, just calories. Lastly some protein will be used to maintain lean body parts (muscles, organs ...) but otherwise excess protein will be burned as fuel, and if not needed for calories, it will be stored as body fat. This is why Holly and I suggest about 50 grams of protein a day, just enough to maintain the body, more is just extra calories, more doesn't turn into more lean body muscle, unless you happen to be in the gym, and even then probably not much more than 50 grams a day are needed, maybe 60, maybe 70. When you eat very low carb, alcohol can hit you like a ton of bricks. In Europe a few years ago my host kept filling my glass an I kept drinking. I really turned into a zombie on not much. My wife thought I was going into a diabetic coma due to my zombie like behaviour. We took my blood sugar, ... normal. Pure alcohol doesn't impact blood sugar. However, if you are low carb, or Keto, it really hits you. that said when i'm having an especially hard day i will look at net carbs if my total is a little over. i'm usually under 10 total, so it doesnt happen often, but i do cut myself a little slack on a holiday or family picnic or whatever. Maria Emmerich suggested to me that I try dairy free for a month. I made it about 6 hours...cheese is my last hold out. i truly do not much like keto food..i'm a potato/bread/fruit girl, and i really dislike the mouth feel of fat, so i had to change my entire mind set from food being pleasure and tasting good to it being nothing but fuel. so when i went to give up cheese, which i do love, it came down to eat cheese or quit keto..so i picked cheese. i lost somewhat slower, but thats ok.
on the strips. I do not want to discourage you..and they are a good indicator in the beginning of when you are in ketosis..but then they become very inaccurate. I've never used them..i researched them before i spent money on them (i'm poor and have to watch every penny) it seems after you are well adapted, people get freaked out because they now say you arent in ketosis..this actually is a good thing..if you know you are doing everything right and that happens, think good thoughts..it means you are burning the ketones instead of spilling them into your urine. which is what you want..so..if you know you are staying totally true keto, and your color goes less, dont panic!!! Holly, I am tracking net carbs... I'm using the Carb Manager App. I was eating about 1800 + in calories. I redid my macros on ruled me.com, and my macros now say about 1655. I have heard from Ketogenic Girl and Leanne Vogel podcasts that dairy can be a problem... Also, I have from time to time used xylitol and I wonder if that has "slowed me roll!" The other thing I noticed is I was getting hungrier and was craving more. I AM in ketosis... at least my urinalysis strips say I am! Oh, I didnt think YOU were..just was an epiphany to me that i realized I was!! and the rhubarb muffins were OMG good. i made up the recipe.and couldnt be happier with it!! Hey if you can fit wine in..go for it!! For me, its better to go plain. i hate it, but it works for me. After an extremely long and hot horse show last summer, the judge took me to supper, and i had my second drink since starting keto (the first was my trick for going on a plane..a small single serve bottle of rum mixed into a sprite just before boarding..lol..and i was fine with that) anyhow i got a diet coke and vodka, and it made me really stupidly drunk. As in..as we were leaving I went in the employee only door before the judge stopped me..and i literally fell down the ramp outside. ONE DRINK!! and the next day i had to take a lot of good natured ribbing, and ended up with my one and only bout with gout. My doc insists it couldnt have had anything to do with the drink..it came on literally within 2 hours of having the drink. But i'm not so sure..
and, in october, my son from minneapolis comes for his once a year visit. my son from CT comes up, and my daughter and her sig other come over. it was a source of great glee for them when i had ONE Whiskey and zevia ginger ale, and got so stupidly drunk they cut me off. One sip of a mixed drink and i can feel it...I've heard others say the same. I tell my favorite guy i'm one cheap date anymore!! I should mention..that i have always been able to hold liguor well, so for me to get wasted on ONE shot is pretty shocking to me..so..i've pretty much sworn off it. for that reason only or i'd fit it in!!! I dont care for wine at all, so thats out, too. sigh. enjoy your wine. we have to have some things we like!! i'm about to cook down some rhubarb..its one of my favorite things and my personal indulgence. and trust me if i could afford macademia nuts..they are my favorite..but i just cant afford them. my favorite guy's family lives in maui--his mom sent me a box full of them for Christmas last year..there were some chocolate covered ones i saved for the tiny bit of time i took off at christmas. there were garlic ones..that i would kill for..seriously that good. then his sister sent me a package a month ago with some things from her shop..and a big bag of chocolate covered ones..which are in the freezer for this coming Christmas..lol. she has no clue i do keto..
anyhow. like i said enjoy the wine!! Yay Holly!! Although rhubarb muffins sound very yummy to me! I've read about the resistant starch in cold potatoes several places - and really, it's the mayo/mustard/pickle combination in the sauce that draws me in. I made a "faux" potato salad with slightly cooked zucchini a few months back, and it was tasty. Not quite as good as potato salad, but not bad at all. Really I should just make a whole container of egg salad and I'd be a happy camper. I'm not looking to get away with as much as possible either. Just be as consistent with the keto mindset, and not totally lose my mind. To me, a glass of wine now and then gets me there. I had several over the weekend, and now a dry week. This is livable life for me, and I can continue doing what I'm doing no matter what. I think the thing is to plan ahead. The suggestions you've made are great. Also, macademia nuts. Almost all fat, low protein, low carbs. They can fill out a day that is a little short on fat grams and seem like a dessert to me now. ok so..gotta tell you..as far as i'm concerned a potato is a potato..a carb is a carb. i'm just saying no..lol. i guess i really do have a handle on it now, because i realized with this conversation i have no desire to try and fit anything in that is carby or inflammatory. the day the doc told me i could be done losing..i called my best guy from the office...and told him. he said..yay!! go have a piece of cake!!! i laughed and said...are you NUTS?? NO!!! lol..and that, for me, is HUGE. because Holly used to be..YEAH go have the cake, fruit, and popcorn you have missed so badly. The new Holly said..no desire for it. none. zip. i celebrated by making 12 cream cheese rhubarb muffins. of which there are still 9 ..in the freezer. and if you set the serving size to 100 grams, you get 20.1% of the weight being carbs, even if you don't count the fibre, it is still 18.3%. No indication on that website if any of those carbs are resistant to digestion (and just how resistant?). This article puts a number on the change in resistant starch for cold potatoes. Says it has 7% resistant starch (7 of the 20 grams?) for cooked potatoes, which increases to 13% ( 13 of the 20 grams?) when cold. So that would put cold cooked potatoes has having about 6 of the 20 grams of carbs become more resistant to digestion. That doesn't mean indigestible, just less digestible. Had to get the fuzzy numbers right, but maybe look at cooked cold potatoes as having 14 grams per hundred as digestible, rather than 20 would be about right. Still, my personal rule is to avoid things more than 6% carbs, so still way to high to consider. Kathleen, I agree! Potatoes are potatoes, period. And I've never heard of the cold potato thing, sounds kinda weird to me. Holly, sounds like a busy week for you and a good plan to stay on track at the horse show! I'm a happy camper this morning. I was afraid I had knocked myself out of ketosis because I have gone back to counting net carbs for a while... (gut issues that had gotten bad and my last resort was to up my fiber to see if that helped. I had even stopped drinking wine and coffee! ) My total carbs for the past two days have been between 30 and 35. I had been counting total carbs and staying under 20. Anyhow, I did the dip test with strips this morning (I know, I know... but it's what I have) and it turned a deep dark purple. I am elated. It appears I can eat that many total carbs and still stay in ketosis! (Net carbs have been 10 both days) I'm sure I'll slowly get back to counting total carbs if net carbs eventually fail me, but right now I'm feeling better and still in "large" ketosis. James, an interesting look at digestible/undigestible foods. My hubby and fil both will eat a slice or two of raw potatoes, sweet or white, when preparing for cooking (not now, he's keto, too.) and I always thought raw potatoes nasty. The topic of "resistant starch" pulled up an idea in my mind. If you can't eat something raw and digest it, then it can be on your "eat" list. If it must be cooked to be digestible, then don't eat it. Think about it, if bacteria don't want to eat it, and it can sit on the counter for a month or more and not "go bad", like breakfast cereals, do you think we should want it? How long does it take for a bowl of white sugar to "go bad"? Loads of veggies are eaten raw, or cooked, like broccoli. I've hear of "resistant" starch, that is resistantancn to being digested. Various foods have the same atoms in them, but the orientation of them changes making them more or less digestible. One simple example is eggs. When raw they are liquid, when cooked they get hard. You can't un-cook an egg it is a one way path. I don't know the difference in digestibility between a raw egg and a cooked egg. Another example is a green, unripe banana. If you eat one of these, it is harder, less sweet, and I find slightly slimy when eaten. Then riper is softer and sweeter, and over ripe is very soft and yet sweeter. This process just takes time, and probably at room temperature. You' have to guess that eating an unripe banana would have fewer digestible carbs. Potatoes seem to be another similar thing. I don't know if one can eat a raw potato. Its hard, ... can we even digest one? That is why people cook potatoes, to change the potato chemically, and make it digestible. I think that letting the potato cool down (like in a fridge), can reverse its digestibility to some degree, and make the starch more resistant to digestion. But is it enough to make it possible to eat on a Keto plan? I don't know. Yeah i cant see how making them cold is going to make them less carbs...never ever heard of this..lol. guess i'm sheltered!!! LOL!! Off to the bakery. huge load for this weekend then a horse show to run on sunday--first one of the year, which is always the worst. after that i just preenter everyone from show 1 and add the few that pop in for the later shows. shopped yesterday...got cheese sticks, sliced sealed up pepperoni, a case of water and a 12 pack of flavored seltzer..that should all last me the 5 shows i run in the summer..will have to get more for the travelling shows but at least i have ZERO excuses now to eat "fair food". i'll boil some eggs on saturday to take, too. that'll do me for the day!! Yes I knew about the cold potatoes for many years. My doctor told me that a long time ago. He even advised to make sweet potatoes put them into the refrigerator and eat pieces of them cold when you get a craving. And reg white potatoes- make them and keep cold with a very little sour cream on them. Are suppose to be better than hot. They say cold potatoes are "resistant starch" and enters blood stream much slower. Well I say from experience, "A potato is still a potato any way you use it! "NO potatoes for me. Temperatures are finally up here with 95 degrees yesterday. It was hot. Staying cool in the house and doing some hand quilting this week. Iâ€™d never even heard of the cold potato thing!! Good job staying away from everythingâ€”I know itâ€™s hard when we are such a food based society! 5 day weigh in - gained .5 pounds. Guess that's not too bad for having wine 3 of those 5 nights. Well, at least my food was spot on. The ketovangelist coach is answering some good questions. For instance, the cold potato issue. Is resistant starch okay? When you cook potatoes, and cool them in the fridge for 8 hours, do they suddenly become okay to eat? She says no. There is very little info on that, nor are the studies there to back that up. Maybe some day it will become definitive, but not now. Sadly, she said no to beets and hummus. My mother in law makes the BEST hummus ever - so garlicky and delicious. I missed the potato salad and hummus, also the tres leches pudding, but everything else I didn't even care about not eating. So I persevere. Two days until I have my monthly results. Are you counting net or total carbs? Those are the first things Iâ€™d look at.. This team is awesome! I have been reading back over the last week or two of posts. James and Holly, you two are great leaders! Thanks for investing in Team Keto! James, creamy chicken? YES! blue cheese dressing.... Mix 1 package blue cheese, 1 cup mayo and 1 cup sour cream... It's to die for... My hubby eats on just about everything! Holly, your news from the Dr. visit is awesome! Congrats! Wanda, I am SO with you on the cravings after a cheat.... I had a couple days of cheating for the first time in 7 weeks... I have learned that it is ALL or nothing for me... And I am back in ketosis with renewed focus and inspiration. Monthony, I am in a stall as well. I am hovering around 201 lbs or so... And haven't really dropped for 5 weeks. HELP! Karen, I hope you'll share how the Ketoevegelist coach works for you! I'm on pins and needles waiting to hear more about your experience! It's great that your labs and health markers are looking good! Wandering Cuppa! I'm a coffee girl myself! My half n half is a large part of my carbs each day! RitaSpins! Congrats on the loss and your cream cheese omelette sounds DELISH! I am almost ready for summer! I am finishing up the school year (I reach second grade) and spent the Memorial Day weekend doing paperwork! I have only three half days with students and one teacher workday left, Then I am off to NC babysit my 4 "army kid" grandchildren while my daughter completes her internship for her Bachelor's degree! I plan to cook and eat keto, as I'll be cooking supper most nights. Have a blessed day, everyone, and thanks for being such a great team! I had a wonderful Memorial Day. I spent it with old friends whom I hadn’t seen for a long time. It was also a birthday party for the mom who tuned 93. We talked of those we lost and how special they were. The birthday mom lost her 16 year old daughter in a car accident when I was young and in nursing school. She was like my little sister. Most of the men in my family were in the military, except one brother. I appreciate all they have done. I was also terrified of my son ever going in the military if there was a draft again. My heart breaks for these men and women for all they do and for what they give up, leaving their families behind. All of you are so encouraging. I love checking in to see how everyone is doing. I’m in a serious stall. I read your words of wisdom and experience, hoping to get through this and lose another 20 to 25 lbs. Hope everyone is having a good day..
Lovely memorials for your families. You ladies have every reason to be proud of your dads. My dad tried to enlist but had a spot on his lung so they wouldn't take him. He was so disappointed, as all 3 of his brothers served. Turned out the spot was dormant tuberculosis. Company is on their way. I'm excited to see them. I'll try to check in while they are here. Wish me luck on the food consumption! Eating a "normal" amount of carbs (North American adult average is 330 grams a day), the body has a certain shock about this being cut to virtually zero ( 20 grams a day). Your body chemistry is oriented to be best at extracting calories from carbs, not from fat or protein, it does that, but not well. Sort of "jack of all trades, master of none". So it is a tough shift. Part of it is truly physical, its not weak willpower. Day 2 to 3 is typically the hardest, as your body has stored carbs (in glycogen) that last about that long. Possible headaches, possible weakness, possible dizziness. I had headaches as a child when I didn't eat, and that was it the cause. Extra water and salt really help. After week 1 or 2, cravings are mostly mental. Yes you might "crave" ice-cream, or chocolate bars, but at that point ask yourself, am I hungry, am I weak, do I feel physically unwell? Chances are it is a mental craving, just like a smoker would want to have a cigarette at that point. I used to smoke cigarettes in my late 20-s for about a year and a half. I do remember quitting and thinking "it would be nice and relaxing to sit back and have just one cigarette right now, I'll buy a pack and enjoy just one, I'll only have one or two per day, ... and so the mental bargaining would begin". Fortunately I came to my senses. a trick I do with pictures that are oriented correctly on my computer, is to edit them on my computer, and rotate by 180 degrees (so upside down), and save. Then edit again, rotate by 180 degrees (so the right way around again), and save. It appears to do nothing on the computer, but somehow internally some orientation information gets injected unseen into the picture file. After that I upload it to spark people ... works for me, hope it works for you. You can even edit your previous post, and possibly fix the orientation problem that way. Nice display of your dad's service. I can fully understand why some veterans would not want to come to a school to talk about their service, as much as the schools would like the children to have a connection to real people who served in the military for their country. The actual experience, of wounded, of dead, the trauma of that time, ... and being asked questions about it. It could be very hard emotionally, I'd expect it to be. My dad was a paratrooper in WW2 - there on the day of the Battle of the Bulge. He also did not speak of the war, until he was in his 70s, and there were schools that asked for veterans to come and tell children about the war. He served with pride, got wounded (x3) but came back alive and had a long and happy life until he died at the age of 83. We are very proud of him. Sorry about the sideways pic - cannot get it to move. Rita that to me is what Memorial Day is for. My grandfather was the same, he was gassed in WW1 and died from a brain tumor due to it. I like to remember my dad on Memorial Day. He served during peace time, but died due to cancer caused by witnessing atomic bomb testing at sea. He didn't die in combat, but still gave his life for this country. thank you for this post, Wanda. this is what its about. Thanks for all the suggestions. I'm going to make this work! I hesitated about getting on the scale this morning, as ice cream usually puffs me up with fluid retention, but I was down a half pound! That gave me the incentive to stick to my guns!! 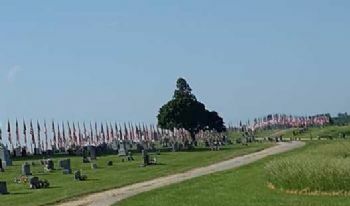 I went for my morning walk at the cemetery. It is so beautiful. 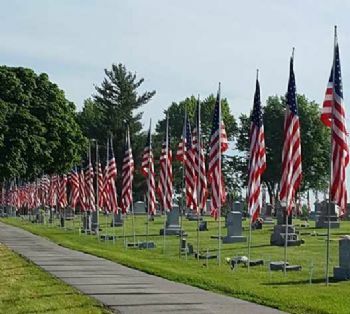 There are 401 flags put up for Memorial Day. It was somber, yet a reminder to be thankful and to reflect on all that those have fought for our freedom. James..your friend sounds like my dad. He was at Normandy. His job in the Battle of the Bulge was to find and diffuse land mines set by the Germans. He took part in the death camp liberations. It was horrendous. It haunted him his entire life. It also made him grateful for every single day..my dad rarely got angry or mad..he was just so glad to be alive, and also felt guilty that he came home when so many didnt. And worst of all..my dad was German. His parents came here from Germany. I have our family history back to the early days..the 1100's. Germans keep immaculate records in their churches! But he was fighting against his ancestral home. His family. I am in awe of veterans..all of them. What they did for us is just so selfless and amazing. I'm so glad your friend had a long life.. I just wrote a post..and am instead switching it to a blog. 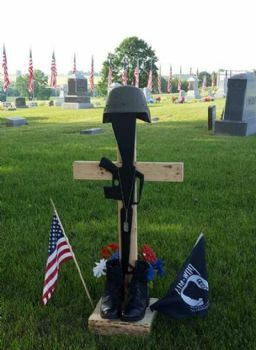 Memorial Day isnt about picnics for me. I am the daughter of a WW2 Army officer, and as such we had a different view of this day. So I lay low. spend the day as my dad did. For what the day was made for. Thanking in my heart those that gave their lives in the service of this wonderful country. Please take a minute to remember...and please, PLEASE dont thank a veteran today unless you know them well. Most don't see this as a fun day...and its not about them at all. They mourn their fallen comrades this day. Its a hard one for them.. I'm Canadian, and we don't have this day, but ... yesterday we buried the cremated the remains of my friend Arnold. He made it to 96 years old, almost 97, and in pretty good health until his final year. He was born in Poland, and of German ancestry. He fought in world war 2, on the Canadian side. He rarely talked about the war. He didn't avoid questions about it, but he didn't bring it up either. He was in an artillery unit. At first I thought that was a safer place to be, way behind the front lines. Over time I learned that he was involved with targeting, which meant going behind enemy lines, and one of the most dangerous things to do. My favourite story of his is that in his 20's he was in a winter single car accident and the car ended up on its roof. He and his friend got out unharmed, after a pause they decided to share a cigarette, and during that time of waiting for help: "I was reported to have said: listen the radio still works upside down". I asked him, "did you say that? ", and he replied "that is what was reported". He had a sharp wit, and having survived world war 2, he drank life in. Yesterday, in a small cemetery out in the countryside he was buried next to his wife. The last thing in the grave was his world war 2 beret. In the end, though I don't condone war, I am thankful to Arnold, and others, for their sacrifice for my freedom today. Yep I totally agree James - but this is a degree in the right direction. We've been married nearly 30 years, and he's seen me go on a lot of "diets". For the past sixish months, he's gone from "are you still dieting?" to joining me in a discussion of my sister wanting me to eat cookies she made, and telling me "you don't have to eat those if you don't want to" and supporting my way of eating. I'm hoping he will join me some day, and I believe when I lose all my weight, keep it off, and still enjoy the food I'm eating he may. When he's ready for the science, I'll be ready to explain it to him. Until then, it's just one of the things I'm doing now, that he supports. And when we go out - he makes sure there is something on the menu I will like to eat before suggesting a restaurant. So it's baby steps with him. He'll see it's not temporary when it ends up not being temporary. Until then - he eats what I cook, and adds his whatever to it. That's good enough for now. may I offer some moral support. With that line from you husband: "Karen is still on her thing"
Its not supportive, and it sounds like he thinks its temporary, like maybe in the summer it will be back to "normal". I wish you strong inner resolve, I wish you harmony in your partnership, and I wish you to keep getting healthier ... I think you know where old habits will lead. "So Wanda my thought would be have your food. Have your hubby's food, and get one or two things for your guests and call it a day. Being hospitable does not mean you need a plethora of choices for other people, just a few." I then eat it all except the last two. I was at my sister's all day yesterday - with my brother, his girlfriend and my hubby. We were all doing work (hanging curtain rods, reinstalling newly painted kitchen cabinets, lugging stuff from here to there etc) and worked hard for 8 hours. She has very bad knees, is single and walks with a cane. She cannot stand up for more than 2 minutes at a time. About 2:30 pm, someone said they were hungry - she offered to go to Subway for everyone. My hubby speaks up and says "Karen is still on her thing" get her a salad! I was super happy to hear him stick up for me, I would have just tossed the bun had I gotten a sandwich anyway, but the salad was quite good. They did not have blue cheese dressing, and I don't trust anything else being sugar free, so opted for some Southwest Chipotle in the frig that had 2 grams of carbs. When we came home, about 7 pm, we had left over ribs, corn on the cob, smashed garlic potatoes, and spaghetti squash. I ate 4 ribs with butter on them. No one said a word. I don't think others even care, as long as they have something they like on their plate. That being said - Happy Memorial Day to everyone! Those that have served, those that support those who serve or have served, and those who just enjoy the holiday!! So Wanda my thought would be have your food. Have your hubby's food, and get one or two things for your guests and call it a day. Being hospitable does not mean you need a plethora of choices for other people, just a few. Really good! I modified and donâ€™t do a crust. Tastes just like realâ€�! That's funny Holly! I re-read my post and see why you thought that's what I meant. I would just like to have lots of extra veggies, instead of just enough for Scott and I. How was the cheesecake? I have seen recipes, but haven't tried one yet. I'm afraid I would eat the whole thing in one sitting. ahh ok. you said you couldnt have extra veggies on hand..i thought you meant for YOU! i have to tell you..its not being a bad hostess when others have odd likes and dislikes or needs, and you do your best but just cant make everyone happy. I take my food when i go anywhere. my mom used to have a cow..shes a food pusher, and it really makes her nuts when she cant have what people can eat..and lots of it. i've told her over and over..if you insist on having something for me, have salad and plain meat and butter and i'll be fine. she just cant wrap her head around no potatos and dessert. last time i was there, for easter, i took a keto cheesecake. she was all excited to see i was eating "normal". i didnt say a word..it made her happy so it was fine. Holly - I do have plenty for me to snack on. I'm just worried about everyone else! Scott will be able to snack on veggies with me. It's my poor SIL who I'm most worried about since she doesn't like veggies and really doesn't eat much fruit either. I'll get fresh strawberries and watermelon for her, so maybe that's all I need to worry about. I want to be a good hostess. But I also know myself well enough to know how much I'm tempted by certain foods, so I'm trying to be fair to myself and everyone else in the process. If I'm at another venue, it's much easier to walk away from temptations, but when they are in my own home, it's a different story. why can you not have things on hand for YOU to snack on? you are getting special stuff for everyone else..i think you should be able to have your own, too!! cut up cheese..have some raw cauli and broccoli on hand, peeled cucumber slices, and pickles. let them eat cake!!! I did really good at the ballpark on Saturday. Ate my peppers and cream cheese. Walking taco with no chips and I took along EVOO to add to it. It was so dang hot! After all day sitting watching games, our car temp was 108. It did drop down to 102 by the time we got back to our daughter's house. We were all so hot and tired afterward, we drove thru Burger King. I got a Whopper Jr. without the bun. Today, it was a cool 96. I didn't do as well today. Had some mini-tacos, then I had ice cream. It was good. I think the heat affected my ability to reason! I'm really worried about this week Tues-Thurs. My brother and his wife will be here. He is doing low calorie. Since I've purged all the low fat, "diet" food from my house, I'm a little concerned about what to feed everyone that works for him, me and our spouses who are not dieting. One day, I'm going to put a roast in the oven with potatoes and carrots. I will skip the potatoes and carrots. My SIL doesn't eat vegetables, except for corn, so I'll have some corn on the side. Might grill some burgers another day. With SIL not eating veggies, I can't even have extra of those on hand for snack foods (and my hubby will skip them if there's another choice - like chips or sweets) Guess I'll have some fruit on hand for Scott. Will have to purchase some low-calorie salad dressing and send it home with him. On Thursday we will be going to visit Winterset, Iowa where John Wayne was born (about 75 miles from here). They are huge JW fans. Me, not so much. lol Also if you ever saw the Clint Eastwood movie "Bridges of Madison County", it was filmed in that area, as they have several covered bridges. Anyway, we will be eating at least 2 meals on the road, which is actually easier for me than trying to cook at home for 4 different people with different tastes. Hubby still wants me to have Angel Food Cake with strawberries. I really don't want to, as that is a weakness of mine! A fight might ensue! look for a book called "cholesterol clarity" it will help you to not worry. as Jack puts it..so many people that have heart attacks have NORMAL cholesterol. its not as important as they want us to think. so...when i started keto my cholesterol was 132. when she did my bloodwork last august it was 142. so, for me, it went up. but i'ma not going to worry!! I've read that Keto normalizes cholesterol. I have a co-worker who is getting very low cholesterol readings in her blood work and her dr is concerned. I suggested she read up on Keto, and see if its something she wants to try. I have a new favorite breakfast: omelette with cream cheese and avocado and cilantro. thanks for reminding me, and I'm sure your cholesterol will be just fine. There are two basic types of cholesterol. The LDL (low density ones) which are more extended in structure, and "fluffier", and the HDL (high density ones) which are more compact and ball like. Its all a matter of molecular structure. So the fluffier ones get more tangled together and stick to things, and get tangled with each other, and these are the "bad" type the clog up blood flow, and the HDL are the "good" ones that not only don't get tangled together, they also seem to scrub out the "bad" ones. So the ratio of HDL to LDL is also important. If the fraction of HDL compared to total cholesterol is high enough, then things are OK.
Those concerned with cholesterol should read up. On this team I've seen most people find better blood cholesterol, ... I'd be hard pressed to remember if anyone ever got worse ... once I think, but its hard to say that Keto made it worse, so many things happen in life. Julian Bakery Paleo Thin Bread - Yay or Nay?